Texas Instruments announced on March 8, 2010 the new TI-Nspire Touchpad and Operating System 2.0. The new OS 2.0, including the TI-84 Plus Silver Edition 2.54MP, was released for the TI-Nspire with Clickpad, too. 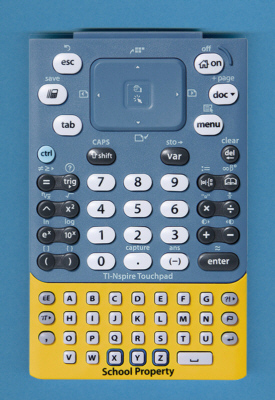 Within the Datamath Calculator Museum the combination of the "school bus yellow" TI-Nspire EZ-Spot with the TI-84 Plus Keypad is referred as TI-Nspire KBD EZ-Spot. © Joerg Woerner, March 16, 2010. No reprints without written permission.